That’s right, It’s March. And that means St. Patrick’s day is just weeks away. I will never forget St. Patty’s Day again, as my little munchkin was born the day before, on March 16, 2010. I have never been to Ireland, but it seems like such a beautiful place. I would love to cozy up next to a fire in a pub in the countryside. Stout cupcakes. Sound crazy? Well, I’m not a big beer drinker, but the beer in these cupcakes really adds something special. Stout often has notes of chocolate, oats, and caramel, making it the perfect addition to chocolate cupcakes. Ganache is the simplest frosting to make, and shows off the cupcake in this recipe beautifuly. If you’re crazy like me, top with some fleur de sel or good sea salt. But wait until the ganache has slightly firmed up or it will dissolve. photo by Kelly @ Along For the Ride. Check out her great photos of Ireland and the glorious food and restaurants she experienced there. 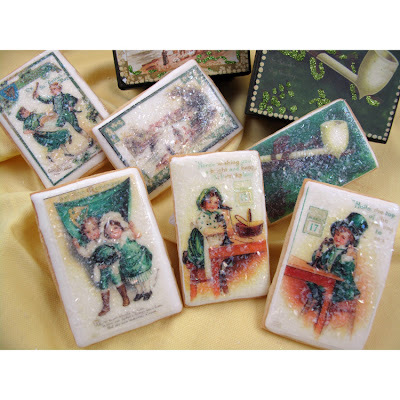 I just found this great vintage inspired edible wafer paper for making St. Patrick’s day cookies and cakes at Fancy Flours. Aren’t they cute? They look fancy, but couldn’t be simpler to make. Fill cupcake cups and bake for 20-25 minutes. Frost with ganache or other favorite icing. Sprinkle with fleur de sel (optional). For the ganache, cook the heavy cream, and chocolate chips in the top of a double boiler over simmering water until smooth and warm, stirring occasionally. Out that sounds awesome. I just ran across a stout creme brulee too! I need to try something like this. I love that we both had Irish on our minds. These look and sound incredible. Love the Guinness image. I want some cupcakes! OOOOH HOW DELICIOUS!!!! Mmmmmmm, I have a strong urge to make cupcakes! I love your blog! Neat blog… happy to stop by here!!! Thanks so much for sharing this on my recipe linky! It sounds delicious. I LOVE stout beer and I'm sure it's amazing with chocolate!